Rydzyna castle, "the gem of Polish baroque" is located between the historic town of Rydzyna and a 12-hectare park. 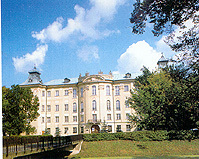 For centuries it was the family residence of King Stanislaw Leszczynski and the Princes Sulkowski. Historic atmosphere, stylish furnishings as well as committed cuisine and service let you experience Polish hospitality. The Rydzyna Castle Hotel is situated 0,4 km away from the town's centre, 0,4 km away from the main bus station, 4 km away from the main railway station and 90 km away from the airport in Poznan. We offer single, double rooms equipped with a tv set, a bathroom, a shower and a telephone. We organize conferences, trainings, parties and family events. We participate in organizing picnics with sheep baking at a firework. There is also a currency exchange office, a rent a car, the games saloon and a car park in the hotel. We also organize trips to and outside the town. At our guests wishes we organize accomodation in neighbouring palaces. We invite you to have a ride in old traditional style by carriages. Our staff provides fully professional service to satisfy our guests demands. The hotel accept credit cards: VISA, MASTERCARD, JBC POLAND, POLCARD, EUROCARD. We offer discounts for the organized groups. We invite to the restaurant for 180 people. The prices concerning rooms refers to hiring for 1 day and don't include VAT. The prices go up by 50% during the banquets. The MKS buses no.12 and PKS leave for the hotel.